Since religious plurality has become a common feature of the globalized world, religious literacy is needed not only to cope meaningfully with this diversity but also to sustain peaceful coexistence. The article sets out to first expound the concept of convivencia before it critically analyzes different models of interreligious dialogue that have been proposed. It shows that while all such models have heuristic values they nevertheless need to be deconstructed for the sake of dialogue to happen. Addressing the need for a genuinely religious approach to the issue the final section states that the outcome of any such dialogue can never be guaranteed nor is it certain. Yet taking the risk implies — at least potentially — a genuine encounter with the truly Ultimate that might reveal itself as such in the course of dialogue thereby enabling people to appreciate their lived differences without jeopardizing peaceful convivencia. 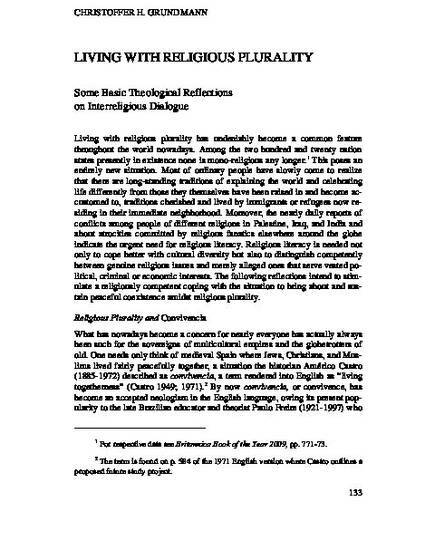 Living with Religious Plurality Some Basic Theological Reflections on Interreligious Dialogue, in: Studies in Interreligious Dialogue, 19, 2009, 2, pp. 133-144.